Camp David is an official residence of the President of the United States. It is northwest of Washington D.C., in Catoctin Mountain park. Staffing is provided by the U.S. Navy and the U.S. Marine Corps. Its official name is Naval Support Facility Thurmont. President Franklin D. Roosevelt had it built to escape the hot summers in Washington, D.C. At the time he called it "Shangri-La. 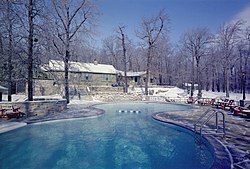 In 1953 President Dwight D. Eisenhower renamed it Camp David after his grandson David Eisenhower. During the presidency of Jimmy Carter, The Camp David Accords were signed by Egyptian President Anwar El Sadat and Israeli Prime Minister Menachem Begin on 17 September 1978. This followed twelve days of secret meetings at Camp David. On September 14, 2005, an 81 year old former worker who helped build Camp David walked onto the grounds to voice his concerns over security problems. He was later fined $15. On July 2, 2011, an F-15 escorted a small two-seat plane out of the area of the camp, while Barack Obama was staying there. They were released without charge. On July 10, 2011 an F-15 escorted another small two-seater plane out of the area of the camp, while Obama stayed there. ↑ "Camp David". The White House. Retrieved 22 April 2016. ↑ 2.0 2.1 2.2 "Naval Support Facility Thurmont". Military Bases US. Retrieved 22 April 2016. ↑ 4.0 4.1 Alison Walker (18 January 2006). "Former Camp David worker gets his message across with security breach". The Frederick News-Post. Retrieved 22 April 2016.